If you want to keep cords and cables from merging into a humongous serpentine mess, and if you like donuts or lazy river rafting, the Cordpro CP-100 may be right for you. Okay, it’s just a round yellow reel, but this is the beauty of it: no motorized parts, no complications — just a simple solution. The Cordpro contains an internal divider that organizes the cord into two separate “chambers” so you can access either side independently. 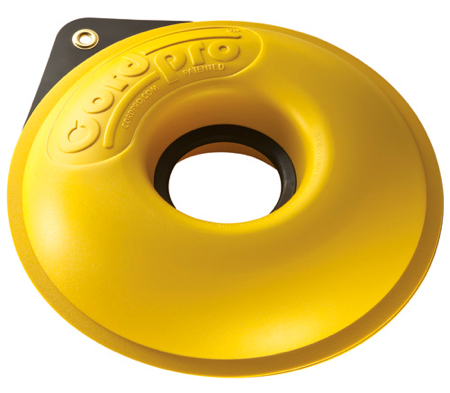 A soft rubber grip protects the center, and Cordpro says the heavy duty polymer (the yellow part, made of the same material as truck bed liners), withstands temperatures down to -100 F — at which point, I would hopefully be focusing more on avoiding hypothermia than organizing my extension cord, but at least anyone finding your frozen remains will know you didn’t abide messy cords. You can score a Cordpro CP-100 for about $12 plus shipping. I don’t see the need for all of these cord organizers. It’s not hard to properly coil up an extension cord. People just need to stop trying to wrap them up tightly under their elbows. I’ve seen contractors wrap up their extension cords with some kind of slip-knots that keep things from getting tangled, but easily release when needed. I’d ask one of them to teach me how, but I’m the nerdy-guy that can’t even remember how to tie a trucker’s knot after 10+ attempts to learn. Interesting concept. As techieman says, “don’t see the need.” On the other hand, I get “WTF are you doing” looks when I go to store my long cords. I didn’t know it at the time I learned, but it was later pointed out that I was “crocheting” them. Not sure if that is correct or not. The fire department showed me how they wrap up all their cords and ropes. It works great and there is never a tangle – ever! Of course, cord purists say I will damage the cord but some of mine are well past 15 years of age and have no problems. Not sure if it is something I can explain but…..find the center of the cord and make a loop (loose knot) and then reach through the loop and grab both cord halves and pull them through. Repeat until your cord is all pulled through however many loops. When you want to stretch it out, have some hold the center loop and pull the two ends – or you can hook the loop around a trailer hitch, fence post or whatever. Hope this makes some sense. I didn’t know it at the time I learned, but it was later pointed out that I was “crocheting” them. Not sure if that is correct or not. That style of ropework is called chain sinnet. If your REALLY into it, see Ashleys Book of Knots #2868. The website Animated Knots by Grog also has some online info along with animations. I saw someone (a relative) use an undersized extention cord to pull a lot of power, his mistake, but the bulk of the cord was wrapped up in one of these. The heat was compounded by the cover and coiled wire and the whole cord melted. And given that it was all covered up, we didn’t see it until it was very far gone and dangerous. I wouldn’t go for one of these and I would always check cord size and job requirements. I got one of these (the XL) for X-mas from my brother. I really enjoy it! It’s far more costly than the orange “H” style cord holder for $5, but I can get my 100′ 14 ga ext. cord on it no problem. I like it when I go to Habitat for Humanity locations, b/c they never have enough ext cords around. I’ve not had any kinks or twists like I’ve had with the “H” holder or even the bucket w/ a hole in the bottom. Recently I just bought a house and got 2 “wonder winders” from Amazon, and they are great for up to 100′ cords. I have an elec. trimmer so it’s great for that and for all over the shop. That’s my solutions to the ext. cord problems, two great products that serve specific uses for my applications. I also have the XL model. It’s holding 100′ of 12/3 cable with no problem. Easy to unwind as much or as little as needed. The case also protects the cable from dirt, cuts, tangles and abrasion on the job site or in the back of the truck. This is one of the best cord storage units I’ve ever used. I remember in -40 The insulation on one of my extension cords just cracked, it was loud. When it gets cold enough it may as well be pvc pipe. Not really related but the temperature rating reminded me of it. So unless you have a cold weather rated cord (usually blue) don’t try to wind it up when its really cold especially if its super stiff and seems to require excessive force. 2) every other loop twist the cord so it loops behind instead of in front of the beginning part of that loop. That way, every other loop reverses the twist so there is no net twisting of the cord – it coils nicely and uncoils flat. Easy to do once learned. (I use it on hoses too). I leave the ends much longer so they can’t get mixed in with the coils. And to uncoil, I just grab both ends at once, and throw the coils out so the cable stretches out doubled over. measureoncecuttwice, that is the over/under method that was discussed earlier in the comments. A cord shouldn’t be coiled any other way. Well, at least it will keep the cord clean. The knot you are all talking about has many names; the daisy chain, chain sinnet, chain stitch, and monkey braid to name a few. Yes it works good for storing rope and extension cords. As a firefighter I can attest to the fact that many ropes are stored for deployment in this fashion, but not all of them – like our life safety rope. One way to make sure the chain is not so long when done, just double up the rope before tying the chain. Practice makes perfect. For those that feel like they need “rope for dummies” – here is a great website for all knots – it is animated too. A previous comment shares my heat concerns.